Pharmaceutical manufacturers are facing an increased regulatory emphasis on real time evaluation of materials during production. Process Analytical Technology (PAT) – an U.S. FDA initiative – is creating the need for new tools that can provide on-line quality measurements to ensure stringent consistency and performance standards are met. C-Therm Technologies (formerly Mathis Instruments) in collaboration with major pharmaceutical companies, manufacturers of powder blending equipment, and the FDA, has developed a revolutionary tool to address this need – the ESP™ Pharmaceutical Blend Uniformity Monitoring System. C-Therm effusivity sensors can differentiate between pharmaceutical ingredients based on their distinct thermal characteristics. Using the principles of thermal effusivity, the C-Therm effusivity system employs a network of up to 4 sensors that are retrofitted on blending equipment. At preset intervals throughout the blending process, the sensors – which are mounted flush with the interior walls of the blender – take individual readings from within. Over time, as the blend uniformity increases, the sensor readings begin to converge. When the readings reach the point of lowest relative standard deviation (RSD), the mixture is at its maximum uniformity and blending should stop. The results are delivered in real time during the blending process, and plotted on the LCD screen of the ESP™ Control Unit. Click here for more information on how to sign up for a live demonstration of C-Therm's effusivity technology for PAT applications. For a more thorough overview on using effusivity for blend uniformity monitoring, please see the pages under effusivity and Pharma within the Applications section of this website. For specifications on the ESP™, click here. Designed for a phased integration, the ESP™ networked sensors are engineered for retrofit installation on existing blending equipment. Screen information generated by the ESP™ shows test results captured during a test at Patterson-Kelly using a 3 sensor version of the system. 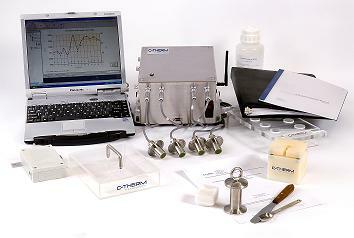 For more information on the C-Therm ESP please contact us for a private consultation regarding your group's challenges.